There’s a good chance you’ve never personally seen a factory farm or CAFO (concentrated animal feeding operations) — and there’s a reason for this. CAFOs are traditionally hidden from public view. Certain states (like Iowa, where big agriculture rules the roost economically and politically) are even considering making undercover videos taken on such farms — which often show shocking scenes of animal cruelty and filth — illegal. Quite simply, they don’t want you to see what’s really going on, because if you did, you would probably turn away in disgust at the mere thought of eating the foods produced there. Yet, the vast majority of the food produced in the United States comes from these industrial-sized CAFOs. In the documentary film above, A River of Waste: The Hazardous Truth About Factory Farms, you can see first-hand the toll that the modern industrial system of meat and poultry production has on human health and the environment, and realize why a prompt call to action is urgently needed. When you raise tens of thousands of animals (and in the case of chickens, 100,000) under one roof, you’re left with a load of waste. That manure, which traditionally was regarded as a valuable fertilizing byproduct when produced on a much smaller scale, has become one of the most polluting substances in the United States (even though federal legislature forbids animal waste from being defined as “hazardous”). “Animal waste in such volumes may exceed the capacity of the land to absorb the nutrients and attenuate pathogens. Thus, what could be a valuable byproduct becomes a waste that must be disposed of in an appropriate manner. The annual production of manure produced by animal confinement facilities exceeds that produced by humans by at least three times. Manure in such large quantities carries excess nutrients, chemicals, and microorganisms that find their way into waterways, lakes, groundwater, soils, and airways. Excess and inappropriate land application of untreated animal waste on cropland contributes to excessive nutrient loading and, ultimately, eutrophication of surface waters. IFAP runoff also carries antibiotics and hormones, pesticides, and heavy metals. Pesticides are used to control insect infestations and fungal growth. The waste, which is typically stored in massive “lagoons,” often leads to rivers of waste that flow from factory farms into the surrounding environment. As the film described, just one environmental consequence of this is the quick spread of Pfiesteria, a microscopic organism that feeds off the phosphorus and nitrogen found in manure. The film also sheds some concerning light on how easily CAFOs serve as breeding grounds for disease — not only amongst the animals housed there and the farm workers, but also to those of us in the general population. River of Waste mentions H5N1, aka the bird flu, specifically. Although it doesn’t spread easily among humans, its capability to mutate has scientists worrying whether it could mutate enough to cause a human pandemic. CAFOs serve as the ideal place for this to happen, as there are millions, if not billions, of host birds among which the virus can flourish. Aside from various strains of influenza or other viruses, feeding livestock continuous, low-dose antibiotics — a common practice on CAFOs — creates a perfect storm for widespread disease proliferation — and, worse yet, antibiotic-resistant disease. Justone of several now-resistant pathogens, Methicillin Resistant Staphylococcus Aureus (MRSA), is responsible for more than 94,000 infections and 18,000 deaths in the United States each year! CAFO animals do require more drugs, as disease is rampant due to cramped and unsanitary living conditions. It’s a natural consequence of raising tens or hundreds of thousands of animals on one farm. For the sake of efficiency, CAFO animals are crammed into tiny spaces and treated in ways that are truly shocking to most people who are just learning about how CAFO’s are run. Due to these living conditions, a variety of drugs, including antibiotics, are routinely administered to all animals, whether they’re sick or well, in order to keep as many of them as possible alive until it’s time for slaughter. Low-dose antibiotics are also routinely used to boost growth of the animal, and this is purely a financial concern. Larger, fatter animals equate to greater profits. The ultimate price, of course, is that you end up getting a dose of antibiotics and other drugs in each and every steak and chicken wing. An even lesser known issue is the problem with antibiotic-laden manure from CAFOs further contaminating the rest of your food supply. That’s right — even your lettuce may contain antibiotics! These are all powerful reasons for choosing organically raised, drug-free, grass-fed or pastured animal products instead. “Federal legislature currently forbids animal waste from being categorized as hazardous. In addition, on the economic level, many corporations are multi-state and can simply move to another state if local laws become too restrictive for their tastes. Not surprisingly, the U.S. government has a history of supporting these industrial CAFO operations, both by looking the other way when abuse or contamination occurs, and by directly subsidizing cheaply produced beef, and corn and soy used for feed. As it stands, 2 percent of U.S. livestock facilities produce 40 percent of farm animals,5 and these large, corporate-owned CAFOs have been highly promoted as the best way to produce food for the masses. The only reason CAFOs are able to remain so “efficient,” bringing in massive profits while selling their food for bottom-barrel prices, is because they substitute subsidized crops for pasture grazing. Factory farms use massive quantities of corn, soy and grain in their animal feed, all crops that they are often able to purchase at below cost because of government subsidies. Because of these subsidies, U.S. farmers produce massive amounts of soy, corn, wheat, etc. — rather than vegetables — leading to a monoculture of foods that create a fast food diet. Even the U.S. Food and Drug Administration (FDA) has continually made it clear that its loyalties lie with industry, not public health. Instead of enforcing stricter regulations, the agency has simply asked food producers to voluntarily limit their use of certain antibiotics. In fact, on December 22, 2011, the agency quietly posted a notice in the Federal Register6 that it was effectively reneging on its plan to reduce the use of antibiotics in agricultural animal feed — a plan it had been touting since 1977! Joel Salatin of Polyface Farms is a pioneer in sustainable agriculture and has mastered the art of raising healthy, happy chickens, pigs and cattle. I recently visited Joel Salatin at his farm in Virginia. He practices the local, sustainable model of food production, which is in stark contrast to the more prevalent model of large-scale mass food production that’s seen today. The “bigger is better” food system has reached a point where its fundamental weaknesses are becoming apparent, and it’s time for each of us to answer a very important question: what kind of food system do YOU want? As Joel discusses in the interview above, there are basically two different models of food production today, and there’s growing conflict between them. The first, and most prevalent, is the CAFO model that takes a very mechanistic view toward life, whereas the other—the local, sustainable farm model—has a biological and holistic view. I encourage you to support the small family farms in your area, particularly organic farms that respect the laws of nature and use the relationships between animals, plants, insects, soil, water and habitat to create synergistic, self-supporting, non-polluting, GMO-free ecosystems. Whether you do so for ethical, environmental or health reasons — or all of the above — the closer you can get to the “backyard barnyard,” the better. You’ll want to get your meat, chickens and eggs from smaller community farms with free-ranging animals, organically fed and locally marketed. This is the way food has been raised and distributed for centuries … before it was corrupted by politics, corporate greed and the blaring arrogance of the food industry. FoodRoutes — The FoodRoutes “Find Good Food” map can help you connect with local farmers to find the freshest, tastiest food possible. 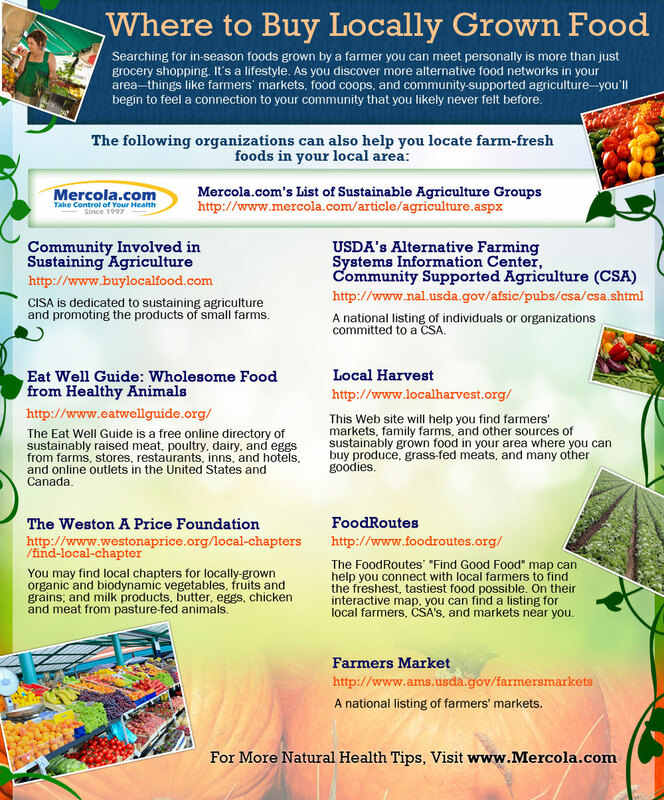 On their interactive map, you can find a listing for local farmers, CSA’s, and markets near you.